&Denim Size 2 blue western shirt. Bill Blass Lined Button Front Denim Shirt. 100% Cotton. collar to hem 31". underarm to hem 18". underarm to underarm 24". Levis Western Pearl Snap Shirt. Long Sleeves. Vintage Mens Denim XL Button Up Distressed Tank Top Walt Nametag Rockabilly . Condition is Pre-owned. Vintage lightweight denim cotton distressed tank top Button up Walt patch No size. Best fit a XL - 2XL Missing a button as pictured Pit to pit is 24” Length is 26” Shipped with USPS First Class Package. 27” shoulder to hem. 22” sleeve. 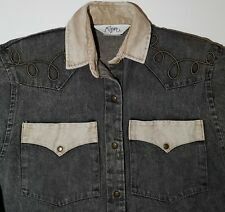 VTG Roper Denim Snap Shirt. Made in USA. It is in excellent pre-owned condition with no holes, tears, or stains. It has a button front, standard pointed collar, inset side panels on both front and back, and a buckle back. Machine washable. Authentic Harley Davidson Denim Crop Top. Very nice condition. Chain hanger at neck. H-DHarley Davidson Motorcycles Logo above left breast pocket. Fringe Bottom. Length from collar to hem: 16". alanui denim shirt new with tags. Condition is New with tags. Shipped with USPS Priority Mail. 18% polyester. 82% cotton. 30" sleeve. Soft fabric size small. Chest (taken under arm at seam where it joins sleeve) 38". Sleeve (taken from shoulder seam to cuff) 25". If you need precise I can follow instructions to what you need just ask. Denim Shirt. Snap Button Front. 29" Collar to Hem. 100% Cotton. Made in USA. Liz Claiborne Lizwear. 1990's Cropped Denim Tank Top. Polo Jeans Co. Ralph Lauren Long Sleeve Denim Blue Jean Shirt. Total length 25 in. Sleeves 23 in. Shoulder to shoulder 17 in. Armpit to armpit is 20 in. 100% Cotton. Measurements are taken with the article of clothing laying flat. Sleeve lengths are from pit to end of sleeve. Total length is from top of shoulder to hem with shirts and waist to end of leg on shorts. Waist measurements are flat number x2. Please use your favorite comparable piece of clothing as a comparison and don’t simply assume the tag is your size as different fits and brand sizes vary widely. Excellent pre owned condition. From smoke and pet free home. Super Cute and Heavy Jean Wrangler Shirt and This is in Excellent used condition. Gently preowned in good used condition, distressed western style shirt with pearl snap button. Dark indigo blue denim with blue, gold, dark red and clear beading. Front caped yokes and pockets, button closures, long sleeves, mid weight denim. Hand wash only. Overall Length 29. Shoulder to Shoulder 21. Condition is Pre-owned. In great condition. NWT Vintage Levi’s Made & Crafted Jeans Denim Pullover (generous fit) Size 4 MSRP $198 Tunic Shirt with button tuxedo cuffs. Made with Japanese fabrics “at the highest level of quality and craftsmanship.” Condition is New with tags. Shipped with USPS Priority Mail. I have not found anything like this online! Made by a brand known for quality and style~Grab it while it lasts!!! Take Two Threads. Armpit to Armpit= 25. 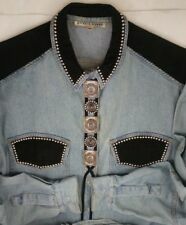 Light blue denim color with jeweled collar. Soft Cotton denim construction. Material : 100% Cotton - Denim weave. Chest : 38" (stretchy). Front button closure. Rounded bottom hem. Size: US Small (S). This is a great western shirt by Lawman. It is a faded blue denim color. Shoulders: 15.5", Armpit to Armpit: 20", Waist: 17.5", Sleeve Length (from Shoulder): 24", Length at the Back: 25.5". I will answer you as quickly as I can. Lots of great Western stitching & cut details that make this so adorable! 22" body length from top shoulder to lowest point on front hem. 36" chest circumference. 15" shoulder width. FINE PRINT ~. Take Two Threads. Armpit to Armpit =21. Nanette Lepore Chambray Denim Tiered Blouson Sleeve Star Blouse Top Small. Tiered blouson sleeves add a dramatic look to a star print boatneck blouse. Long tiered blouson sleeves with single barrel square cuffs. Varda Garfinkel Womens Top Rockabilly Western Square Dance Denim Sz L. Condition is good, Pre-owned. Features fringe and rhinestones. Zipper top opens up with attached second layer. Shipped with USPS Parcel Select.